Los Angeles often is caricatured as a locale with little or no history apart from movie studios and Disneyland – as the great American tabula rasa for modern experiments such as urban sprawl, automobile-based living, and flashy architecture with no connection to the past. Two influential Southern California architects, Stefanos Polyzoides ’69 *72 and his wife and professional partner Elizabeth Moule *87, are struggling to dispel such notions in their efforts to reform the urbanism of this great metropolis and reconnect it with its history. Moule *85, are struggling to dispel such notions in their efforts to reform the urbanism of this great metropolis and reconnect it with its history. Co-founders of the Congress for the New Urbanism, along with Andrés Duany ’71 and Elizabeth Plater-Zyberk ’72, Moule and Polyzoides espouse a novel approach to accommodating continued population growth in what is already the most densely inhabited metropolitan area in the United States. They aim to make growth desirable by addressing environmental concerns, improving streetscapes, and forging meaningful links with the building traditions that have defined many of Southern California’s most cherished places. While many of the buildings they design bear a modern imprint, the two are not concerned with the stylistic fashions of the moment. Though Moule and Polyzoides, who preside over a staff of 30 in their Pasadena office, are designing communities for undeveloped “greenfield” sites ranging from an ecologically sensitive riverfront property outside Philadelphia to a gritty locale in the midst of factories and agricultural fields in Ciudad Juarez, Mexico, it is their “infill” projects in urbanized areas of Los Angeles County that have attracted the most attention. They also have produced campus plans for numerous academic institutions in Southern California and designed noteworthy residential buildings at Pomona College and at the University of Arizona in Tucson. pattern of urbanization, with businesses as well as residences clustering along them. Downtown – the nucleus of this transportation network – became increasingly congested. During the 1920s, Angelenos opted for a ubiquitous, grid-patterned road network that, along with the freeway system that began to take shape before World War II, would generate the sprawl of indistinguishable tracts of single-family homes, office parks, and shopping centers. Automobile dependency, air pollution (the term “smog” was first coined in L.A. in 1942), and the loss of natural landscapes – and the trolleys – were the by-products of a metropolitan transformation Moule and Polyzoides have deplored in critical essays. But sprawl has about run its course in Los Angeles County. Like the surrounding jurisdictions, it is almost entirely built out. Freeway construction as a remedy for gridlock has run into strong public resistance, as demonstrated by the recent shelving, after a decades-long struggle, of plans for the final 4.5-mile section of Interstate 710 in the eastern part of the county. Moule and Polyzoides’ vision of “the next Los Angeles” is largely grounded in the streetcar metropolis of the early 20th century. The two architects enthusiastically support a beefed-up transit system focused on light and heavy rail. “We want transit to serve a population that can’t afford a car,” says Moule, who graduated from Smith in 1982 before pursuing architectural studies at Princeton. “But we have to attract a population that can.” Since 1990, Los Angeles has introduced a $7-billion, 73-mile light-rail and subway system, some of it running on the old streetcar rights of way. (Six more miles of light rail are due by 2009.) Most of the regional Metrolink heavy-rail commuter system’s 512 miles of track runs through Los Angeles County as well. There is, of course, considerable disagreement about the cost-effectiveness of using rail transit to wean Americans – in Southern California and elsewhere – from their automobiles. A “transit-oriented development” designed near a light-rail stop in South Pasadena, a small city that would have been bisected by the Interstate 710 project, demonstrates how Moule and Polyzoides have advanced the art of densification, while seeking to enhance the viability of rail transit. Their Mission Meridian Station project would have raised NIMBY hackles galore were it not for the way it fits in with its setting. 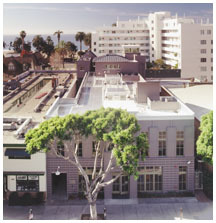 At the intersection of a commercial thoroughfare and residential Meridian Street – the latter lined with Craftsman bungalows and eucalyptus trees – the architects have placed a two-story brick Art Deco building that will house a restaurant, flower shop, bike shop, and newsstand, along with mixed-use lofts fronting on an interior courtyard. Next door, Craftsman duplexes resembling the nearby single-family homes face Meridian Street and frame entrances to two bungalow courtyards. Courtyard housing is a Southern California type that regional architects adapted from Spanish precedents a century ago – and that Moule and Polyzoides have single-handedly reintroduced into the L.A. market. Such housing permits much higher densities than a monoculture of single-family homes, but until these two architects came along, it had not been built in Southern California since the 1930s. On Mission Meridian Station’s 1.65-acre site, the architects have fitted no fewer than 67 residential units, ranging from lofts to single-family homes. What distinguishes this project from the older “courts” is that it is designed as a streetscape extending over a city block (strictly speaking, half a large city block), not as the development of a single lot. “This project, in Los Angeles, is absolutely revolutionary,” says Polyzoides, a native of Athens. transit-oriented development intended to reduce the number of auto trips, there will be underground parking for 1,200. In each case, half of the parking will be for rail passengers, and that portion of the garage construction is being subsidized by the state of California. The couple’s finest courtyard housing design is the Seven Fountains complex completed two years ago in West Hollywood, a small municipality that includes the Sunset Strip. The developer inherited two detached houses on the site now occupied by Seven Fountains’ 18 townhouses and two apartments. The site is a mere seven-tenths of an acre in size. Seen from the street, Seven Fountains, which is clad in white stucco, is strikingly picturesque. It doesn’t read as a single building but as a complex, asymmetrical agglomeration of buildings – a sort of hamlet. You enter through an openwork wooden door that leads to a breezeway overlooking the sunken court through which cars access the underground parking garage. At the end of the breezeway, a courtyard paved in ceramic tile beckons the visitor to one side. Turning another corner, you find yourself in a larger outdoor space; it, too, is very intimate in scale, with a variety of flora sprouting from planters and vases. There is an outdoor fireplace flanked by a pair of sofas, and a fountain decorated with ornamental tiles is close by. You look up to a belvedere and its deep-eaved tile roof, offering a view of the Pacific Ocean. Elsewhere, wooden balconies overlook the court. From here you might walk up one level to find a bronze frog spouting water into a small swimming pool, or proceed through another breezeway to a more verdant courtyard featuring an old tamarisk palm. The experience of walking around Seven Fountains echoes in the imagination as a stroll around an ancient quarter in some Mediterranean town. Moule and Polyzoides have provided an example of the Renaissance concept of the building as a microcosm of the city. Seven Fountains also reflects their insistence that the quality of urban space is as important as the quality of the surrounding architecture. And the market has responded positively: Units at Seven Fountains, ranging in size from 1,200 to 1,800 square feet, rent for $5,000 a month on average, with an average assessed value as rental units of more than $500,000 per unit. As condominiums, they would be assessed at about twice as much, Polyzoides says. Seven Fountains garnered considerable attention in the regional press, but even wider media interest was piqued by Moule and Polyzoides’ new Natural Resources Defense Council headquarters in Santa Monica. Underwritten by actor and director Robert Redford, this mixed-use building, containing offices and a shop-front Environmental Learning Center, resulted from the recycling of an undistinguished commercial structure by retaining its wall foundations and part of its concrete frame. More than 90 percent of the Redford Building’s materials are recycled or recyclable, and the 15,000-square-foot building has received the highest rating for “leadership in energy and environmental design” from the United States Green Building Council. The siding on the Redford Building is not wood, but a cement-based compound that is also used for interior cladding. Photovoltaic cells on the roof supply 20 percent of the building’s energy, which it consumes at half the rate prescribed by state conservation guidelines. Floors are made of easily replenished woods such as bamboo. Rainwater and water from showers and washbasins is recycled for the irrigation of plants and the flushing of toilets. Furnishings are made of everything from recycled maple to recycled seat belts, while bathroom stall partitions are made of recycled plastic bottles, and elevator paneling of sunflower seed husks. Light wells illuminate three atria that serve as social spaces on two stories and as the focal points of the interior plan. Offices also receive abundant natural light and cross-ventilation, while room pressure is controlled to expel noxious fumes such as those emanating from copying machines. On the roof, which offers views of the Pacific Ocean just a couple of blocks away, three third-story pavilions resembling stick-built beach houses serve as presentation room, boardroom, and kitchen. The building, with its gray, simply detailed exterior, is anything but an exercise in architectural pyrotechnics. It is meant to fit in with its unexceptional surroundings. But the NRDC’s decision to build its headquarters in an urban center marks a new awareness that building in such settings is an environmentally friendly act, Moule says. Some NRDC workers can get to work on bicycle, and those who drive to work drive less because they can shop nearby before going home. Moreover, the Redford Building is designed for permanence, rather than an investment cycle. 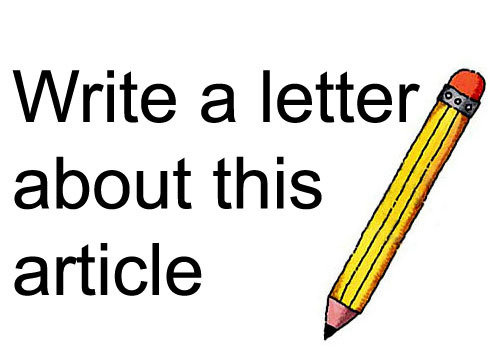 “It has a generic quality that allows it to be reused. It can be home, office, restaurant,” Moule notes. The two architects want to create the next Los Angeles “one building at a time,” they say. Indeed, some of their larger-scale efforts at reforming urbanism in the city have led to frustration. During the 1990s, they led an interdisciplinary team that produced a strategic plan for five square miles of the downtown. The objective was to repair the damage inflicted by urban-renewal schemes that got under way in the late 1950s by using catalytic development projects to stitch together an urban fabric torn apart by vast expanses of parking lot. Another disappointment for Moule, Polyzoides, and other New Urbanists is the Playa Vista project in Los Angeles’ Westside section. In 1989, the couple was invited to join the project by Duany and Plater-Zyberk, whom Polyzoides had encountered as a teaching assistant at Princeton’s architecture school. Moule and Polyzoides wound up leading a team of high-profile architectural firms in the design of a new community on this 1,087-acre site fronting on the Pacific Ocean. Their models were cities like Beverly Hills and Pasadena. Playa Vista was intended to relieve the acute housing shortage in Westside, known for its concentration of high-end, high-tech industries and services. Though the design produced by the architects assumed restoration and preservation of 300 acres of wetlands on the previously industrial site, environmentalists resisted any development at all, a contributing factor in the developer’s loss of the property. The project has gone forward under new management, and the amount of land set aside for conservation has been doubled. But while Playa Vista’s mixed-use character has been retained, Moule and Polyzoides express bitter disappointment with the project’s quality. “It’s unrecognizable to me,” Polyzoides says sadly of the portion constructed to date. “It’s absolutely unlike anything we ever imagined.” Unfortunately, New Urbanist knockoffs are not an uncommon phenomenon. Downtown, Los Angeles has a hard time outgrowing urban-renewal-style, automobile-oriented urbanism. Frank Gehry’s new Walt Disney Concert Hall and José Rafael Moneo’s Roman Catholic Cathedral of Our Lady of the Angels have thrilled architecture critics, but these projects amount to self-contained, drive-in precincts that do little to remedy the stark absence of street life in and around the Civic Center, the result of a pre-existing overconcentration of institutional buildings. A huge, histrionic structure for the state transportation agency, Caltrans, is nearing completion in the vicinity, exacerbating the problem. Moule and Polyzoides, who identify with a line of eclectic, modernizing traditionalists who were active in the 1920s and ’30s, see such buildings as isolated fragments that do nothing to contribute to a larger order – a greater “wholeness” and “completeness,” as they put it – in the city. These are the qualities they seek to nurture through their work, and they see a growing community of designers and developers joining them in their quest in the years ahead. Catesby Leigh ’79 writes about architecture, urbanism, and fine art for numerous national publications.